Pan Pacific Festival: A Three-Day Asia-Pacific Hula Festival in Waikiki. The Pan Pacific Festival: Three Days of Hula and Fun! 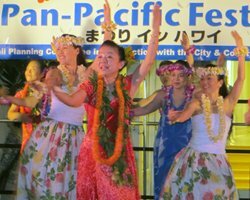 At the start of every summer, Waikiki’s Pan Pacific Festival welcomes visitors from throughout Asia and the Pacific (primarily Japan) to mix with local residents in a three-day hodgepodge of hula dancing, cultural performances, hoolaulea (block party), and a parade. The festival often falls on the second full weekend (Friday to Sunday) within the month of June; and as a result, the events can overlap/intermingle with the King Kamehameha Day celebrations which are usually held at on the weekend closest to June 11. Basically, the Pan Pacific Festival begins with a Friday night hula festival and hoolaulea. The international hula festival is held at the Kuhio Beach Hula Mound. 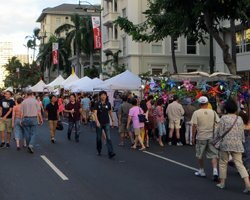 Moving west along Kalakaua Ave, the block party features four or five other stages for exhibitions by numerous local and international performing artists. 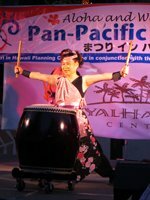 Performances could include Japanese Taiko drums, Hawaiian ukulele bands, Japanese singers and dancers, Hawaiian chants, belly dances, pop/cover bands, and of course: more hula. 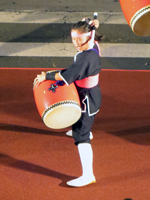 All three days (throughout much of each day) feature a performing arts showcase at the Waikiki Beach Walk Plaza stage and at the Ala Moana Center. The hula festival also continues throughout all three days of the festival. And the weekend is ended by a Sunday evening parade from Fort DeRussy to Kapiolani Park. Best of all, every single event is free! 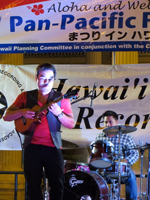 For a complete schedule of events, visit the official site of the Pan Pacific Festival. You don’t necessarily have to plan your vacation around a specific event in a certain month because there’s always a party of some sort or another! You’ll be treated to many of the same acts and attractions that your friend saw at another festival in a different month. So come when you can and have a good time when you get here. In spite of my personal aversion to these kinds of events, I will say this for it… the Pan Pacific Festival definitely has more hula and more Asia-Pacific cultural performing arts than most other Hawaii special events. So if you can’t get enough free entertainment, this is definitely the festival for you! And I further confess that I did enjoy my festival food treats.